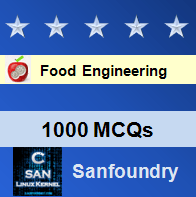 This set of Food Engineering Multiple Choice Questions & Answers (MCQs) focuses on ” Principles of Food Irradiation-2″. 1. Statement 1: Effects of radiation and heat are the same on milk; that is they both influence the rennet coagulation time. Statement 2: _____ balance is important in condensing and canning process. Explanation: Effects of radiation and heat are the same on milk; that is they both influence the rennet coagulation time. Calcium balance is important in condensing and canning process. 2. Irradiation _____ the relative viscosity of albumin in solutions. Explanation: Irradiation increases the relative viscosity of albumin in solutions. 3. Ionizing radiation _____ the thickness of albumin. Explanation: Ionizing radiation decreases the thickness of albumin, but increases the relative viscosity of albumin in solutions. 4. Statement 1: Radiation sterilization might be used for baking since it indicates that the baking quality of eggs is not impaired during doses of ionizing radiations. Statement 2: Enzymes are _____ by ionizing radiations. Explanation: Radiation sterilization might be used for baking since it indicates that the baking quality of eggs is not impaired during doses of ionizing radiations. Enzymes are inactivated by ionizing radiations. 5. Statement 1: Radiation has no influence in promoting tin rot or tin disease. Statement 2: Tin coatings over base steel are suitable for food irradiation. Explanation: Radiation has no influence in promoting tin rot or tin disease. Tin coatings over base steel are suitable for food irradiation. 6. Container shape plays an important role for radiation source utilization. Explanation: Container shape plays an important role for radiation source utilization. 7. Statement 1: Plastic films and other foils might get damaged due to irradiation. Statement 2: By increasing the radiation dose by a two-fold, the resistance of certain organisms to irradiation increases. Explanation: Plastic films and other foils might get damaged due to irradiation. By increasing the radiation dose by a two-fold, the resistance of certain organisms to irradiation increases. 8. Which of the following is important in estimating decimal reduction dose (D value)? Explanation: Both of the mentioned are important in estimating decimal reduction dose (D value). 9. Statement 1: Very young chickens can also be irradiated. This is an advantage of irradiation. Statement 2: Which of the following is an example of ionizing radiation as a unit operation in the field of food and agriculture? Explanation: Very young chickens cannot be irradiated as it leads to fragile bones. All of the mentioned are examples of ionizing radiation as a unit operation in the field of food and agriculture. 10. With respect to which of the following properties of food does food irradiation prove a disadvantage? Explanation: Food irradiation has proved as a disadvantage in the flavor of food. It leads to off-flavor of food. 11. Low dose irradiation has a potential to extend the shelf-life of certain food items but very low doses shows predominant mold formation. Explanation: Low dose irradiation has a potential to extend the shelf-life of certain food items but very low doses shows predominant mold formation. 12. Viruses can be eliminated by irradiation. Explanation: Viruses have very high resistance to irradiation and hence cannot be eliminated by irradiation. 13. Which of the following is true with respect to irradiation for fresh fish? Explanation: The mentioned is true with respect to irradiation for fresh fish. 14. Statement 1: The microbial deterioration of fresh fish is _____ by irradiation. Statement 2: The _____ of oxygen increases the sensitivity of vegetative bacteria to irradiation by two-three folds. Explanation: The microbial deterioration of fresh fish is increased by irradiation. The presence of oxygen increases the sensitivity of vegetative bacteria to irradiation by two-three folds. 15. Statement 1: Freezing to temperatures of -20 deg C or lower reduces the radiation effects in the food. Statement 2: Sensitizing compounds or microorganisms to radiation will help fasten the process and make it more efficient. Explanation: Freezing to temperatures of -20 deg C or lower reduces the radiation effects in the food. Sensitizing compounds or microorganisms to radiation will help fasten the process and make it more efficient.